*Originally published on Tamil Guardian. “Maybe if we all commit suicide then they’ll turn around to look at us lying here and do something,” an amma says to me. “We are ready to die for our children,” another amma adds. I’m in Kilinochchi, sitting once again with the families of the disappeared at their roadside protest. As of today, 148 days – that’s how long they have been sitting here. That’s over 4 months of stifling heat, perpetual dust and roadside pollution where these families have thought of nothing else beside the enforced disappearances of their loved ones. 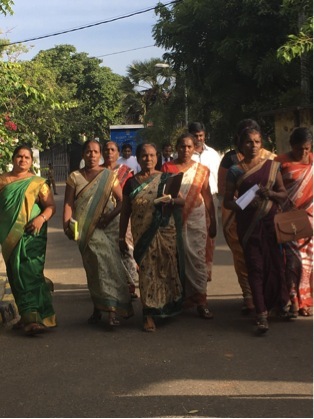 Over the past 4 months, (primarily) women across all 8 districts of the North-East of Sri Lanka have commenced roadside protests with one simple goal – to see their children again. Sri Lanka’s 30-year long war with the Liberation Tigers of Tamil Eelam (LTTE) resulted in over 60,000 enforced disappearances. Sri Lanka has the second-highest number of cases submitted to the UN Working Group on Enforced and Involuntary Disappearances – after Iraq (see here). To date, the Sri Lankan government has failed to even criminalize enforced disappearances – most recently choosing to indefinitely postpone a debate about the bill to do so (see here). Women across Sri Lanka and civil society are currently campaigning to get that bill to criminalize enforced disappearances back into parliament for debate and to be passed (see here). For the women at this Kilinochchi protest in particular, most of their loved ones were forcibly disappeared during the last phase of the war, when they surrendered to the Sri Lankan army because they were affiliated to the LTTE. Many of these mothers physically handed over their children after the army had repeatedly told civilians crossing over into army-controlled territory that anyone, even children who had been taken into the LTTE in the last phase for even a few days, had to be surrendered. The army told people that if they surrendered their children and loved ones they would see them again in a matter of weeks. But that if they didn’t and the army later found out about any possible affiliation, the consequences would be dire. As a result, hundreds of families in the Vanni, the last site of the war, surrendered their children, siblings, wives, and husbands, believing that since the war had ended they had no other option, and hoping that since the war had ended the government might keep its word. Muralitharan Nadesu, Kirishnakumari Muralitharan, Sariyan Muralitharan and Apitha Muralitharan surrendered together on May 18, 2009, and haven’t been seen since. Muralitharan’s amma is part of the Kilinochchi protest. But eight years on from the end of the war, these mothers have yet to see their children again. Instead, they have spent years travelling across the island visiting police stations, military camps, flawed and corrupt commissions set up by the government, NGOs, international actors, and journalists, looking for them. Some of these ammas tell me that they must have told their stories at least 100 times but still not a single person has been able to give them an answer about where their loved ones are. On May 30, 2017, the Kilinochchi protest reached its 100-day mark. Over 1000 families of the disappeared from across the 8 districts gathered in Kilinochchi for a demonstration that blocked the A9 highway, the main motorway connecting the North to the South (see here). In response to this, the government finally responded and the Governor of the Northern Province agreed to arrange a meeting between the President and representatives of the families of the disappeared. Families of the disappeared from across all 8 districts protesting in Kilinochchi on May 30, 2017, 100th day of Kilinochchi protest. Families met with the President on June 12, 2017 and handed over a petition (see here) with a few clear demands: (1) release of a list of all those who surrendered/were detained by the Sri Lankan armed forces during and after the war, particularly during the last phase; (2) release of a list of all secret detention centres, their status and list of detainees; (3) release of a list of all detainees held under the PTA and detainees held in detention centres; (4) release of these lists to representatives from the families of the disappeared; and (5) release all reports by commissions appointed over the years to address the issue of disappearances in public and the Government’s response to those reports. The President told families that he could definitely meet the first three demands, and even promised that he would issue directives to the National Security Council the very next day to release the lists of surrendees/detainees. However, since that meeting over a month ago there has been complete radio silence. Families of the Disappeared from Kilinochchi have sent follow-up letters to both the Governor and the Presidential Secretariat and have still heard nothing. Sujeepan Kandasamy was taken by the army in 2009 – his amma last saw him as he was telling her to take everyone and get out of the war zone while they could and that he would somehow make it out. She now sits hoping that he did make it out was true. Rather, the limited conversation about addressing enforced disappearances in government seems to be mostly about setting up a new body, the Office of Missing Persons (OMP) – a body that mothers in the North-East have made clear they are extremely skeptical of and do not believe will be any different from prior commissions. Their concerns are warranted. The OMP Act passed last August, while containing certain positive elements, has a large number of discretionary provisions that leave the credibility of the office entirely in the hands of politically appointed commissioners. In a country like Sri Lanka, that does not bode well. Further, amendments made to the OMP after it was passed suggest that Sinhala nationalist forces intend to block any international involvement in the OMP, which is a key requirement from the perspective of families of the disappeared for any investigatory mechanism to have credibility. After all, they have already dealt with numerous commissions set up domestically in the last 8 years alone that have been extremely flawed and ultimately all failed to produce answers. The government has still failed to undertake the confidence-building measures required, such as addressing the demands of the families’ petition, that would inspire their trust in the proposed OMP. And so now, in the lead up to the 150th day of their roadside protest, these incredibly strong women are at their wits’ end. Without meaningful government action on the issue of disappearances, their references to possible self-harm are a dangerous reality, given the state of their current mental health, and the levels of frustration, anger and sadness they feel. Just two weeks ago, one of the protesting mothers passed away, becoming the fourth mother to have passed away since the protest started. Many around her said it was the sorrow and stress of searching for a disappeared child that contributed to her untimely death. These women sitting on the side of the road in Kilinochchi in many ways represent the epitome of the strength, resilience and perseverance of the war-affected Tamil population. And today this government is failing them. President Sirisena must uphold his word and provide the families of the disappeared with answers to their petition of June 12, 2017 without any further delay. The international community must also hold Sri Lanka to its commitments and pressure the government to fulfill this demand. The government can no longer ignore and deny these women’s appeals for answers about their disappeared loved ones without accepting responsibility for the harm these women are experiencing. Every day that this government continues to delay providing answers about enforced disappearances is another day driving these women ever closer to devastation.